It’s always a wonderful blessing to wake up and read back over God’s Living Word that we have available to us at any moment. Going back through and looking at scripture through the lens of God’s character has been a reminder how amazing and gracious our Lord is. Today, we get to reflect on His character in one of my favorite verses from Paul in Philippians 4. As we read through these scriptures I try to use the S.O.A.P. acronym to read through scripture and apply it to my present life. S= Scripture Writing down a verse or two that really stands out to you today. O=Observation What are observations about what you read? What do you think God is saying to you? A = Application Personalize what you have read by seeing how it applies to your life right now. P = Prayer write down a personal message from you to God based on what you just read and ask Him to help you apply this truth to your life. 4 Always be full of joy in the Lord. I say it again—rejoice! 5 Let everyone see that you are considerate in all you do. Remember, the Lord is coming soon. 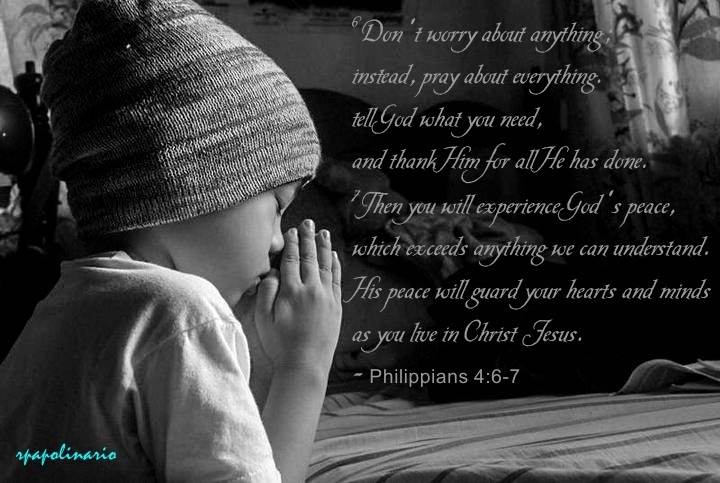 6 Don’t worry about anything; instead, pray about everything. Tell God what you need, and thank him for all he has done. 7 Then you will experience God’s peace, which exceeds anything we can understand. His peace will guard your hearts and minds as you live in Christ Jesus. 8 And now, dear brothers and sisters, one final thing. Fix your thoughts on what is true, and honorable, and right, and pure, and lovely, and admirable. Think about things that are excellent and worthy of praise. 9 Keep putting into practice all you learned and received from me—everything you heard from me and saw me doing. Then the God of peace will be with you. Amen…As a new father of our 3rd child, a husband trying to juggle various needs for our household, a principal getting ready to start the school year, I caught myself up most the night last night thinking about being a being a better husband a more supportive father, being a better son, being a better brother, being a more involved small group leader, being a more engaged mentor, being a closer friend, being a more helpful neighbor, being a dedicated student starting once again back to ISU… There was definitely moments of rejoice about how the Lord can get you right where He wants you, but in all honestly there was more time questioning, concerns, wondering how I will do it? Worry about what it will look like? How do we get the kids from fighting? How can I put less stress on Jennifer? Then in the early hours of the morning, I thought back to these verses for today. The truth is I can’t… but HE can. Colossians 3:15 And let the peace that comes from Christ rule in your hearts. For as members of one body you are called to live in peace. And always be thankful. 1 Peter 2:9 But you are not like that, for you are a chosen people. You are royal priests, a holy nation, God’s very own possession. As a result, you can show others the goodness of God, for he called you out of the darkness into his wonderful light. In verse 8 God tells us how we should think instead. And now, dear brothers and sisters, one final thing. Fix your thoughts on what is true, and honorable, and right, and pure, and lovely, and admirable. Think about things that are excellent and worthy of praise. What would it look like if we fixed our thoughts on these six guidelines today? When we put these guidelines into practice our God of peace will be with us. Dear Father, I know you have a perfect plan for our lives. You transform us from the inside out and only from my own selfish desires do I lose sight of your promises. When we follow your commands, trust in You, You are enough! You are always with us, listening, waiting, providing the Peace that only you can provide in this world. We love you. Amen.